The Halti Walking Dog Harness boasts a stylish, yet practical design that is fantastic for every day dog walking. Developed with a high grade nylon webbing that has been chosen due to its strength and durability, the harness also features 3M Scotchlite reflective strips that help to increase the safety and visibility of your dog, even in low-light conditions. With 5 points of adjustment to ensure a comfortable and secure fit on any size or shape of dog, it also features 2 solid rings on the dog’s back and chest to provide lead attachment points for essential control. A close control handle on the top of the harness allows for instant restraint when required. 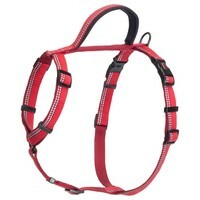 The Halti Walking Dog Harness has 2 double sided clips for easy use when putting it on or taking it off your dog.